It’s amazing what just a few more weeks of data can do. Each morning, I run the pace analysis fo the current quarter and past 4 weeks to understand the overall movement of capital deployment in the U.S. startup market. At the end of Q3 we reported that the pace at that time showed little sign of a slow-down, despite widespread doom-and-gloom bubble talk. 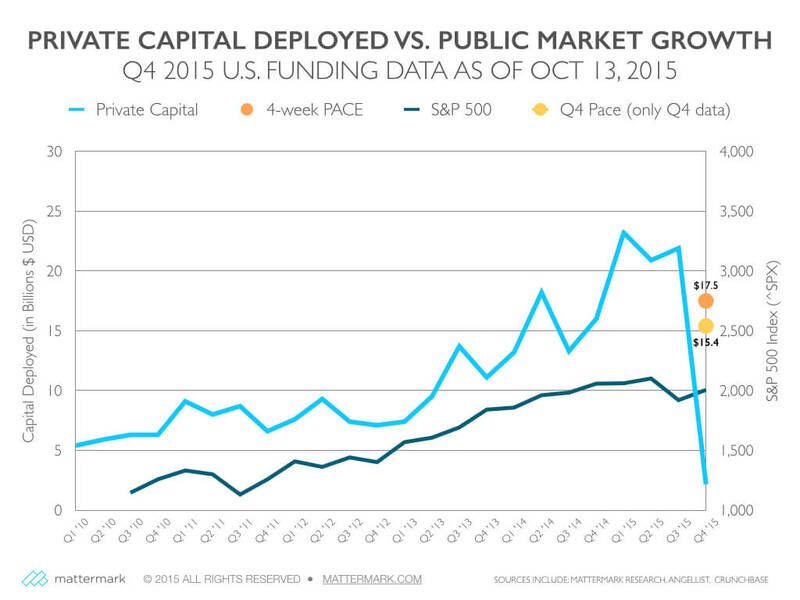 However, venture capital activity does tend to lag weeks or even months between deal consumation and announcement. New data indicates there is indeed a slow-down underway, showing that Q2 2015 was the peak and Q4 is likely to return to somewhere near the top of 2014 levels. Based on the past 4 weeks of U.S. funding announcements, which totaled $5.6 Billion, if Q4 funding activity were to continue at the current pace the total capital deployed would be $17.5 Billion. This a 20% decline from Q3 and just above Q4 2014, which saw $16B deployed.